Fear is an evolutionary response to danger, designed to keep us safe. But anxiety (all about what could happen, rather than what is happening) is an unreliable indicator, notorious for its rate of "false alarms." Teaching your child to recognize and respond more appropriately to anxiety’s false alarms is key to overcoming phobias, and the avoidance often associated with other types of anxiety. Talk to your child about her body’s alarm system; harkening back to the time of cave people to make it fun. Our senses are designed to alert us to possible dangers, sounding the alarm – DANGER – that prepares our bodies to spring into action so we can run away from or grab a club to fight the proverbial saber tooth tiger. But not every snapping twig is a tiger (and bad guys rarely lurk in the closets of unsuspecting children), so we need to learn to distinguish real alarms from false ones, to ferret out possible dangers (the stuff anxiety is made of) from actual bad things. This is where desensitization comes in. Desensitization is both a grand experiment and a powerful brain-correcting tool. It is the process by which your child will intentionally expose himself to the things he fears (see below for how to make this happen) while assessing "Did the bad thing I’m afraid of happen, or not?" And it is corrective because as your child learns to approach rather than avoid the things he fears, he gradually gets used to them, and the danger messages quiet down. To get your child on board with this, talk about swimming pools. 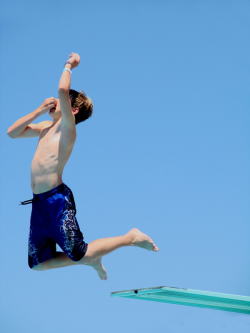 Most kids have experience with jumping into a pool and finding – Brrrrrr – it is cold! But if they stay in, swim around, dive for pennies or chase their friends, pretty soon they notice it isn’t cold any more. Why is that? It’s because they’ve gotten used to it. The water hasn’t warmed up any. Instead, your child has stopped registering the cold; they’ve gotten used to it. This concept of getting used to something is tremendously useful because we can apply it to just about anything we find uncomfortable or scary. If we jump into it – or even step in just a bit at a time – and stay in, we ultimately get used to it. 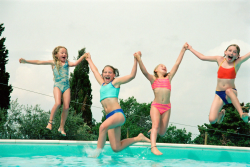 While most children prefer the plunge-in method for actual pools, they tend to choose the step-by-step method when facing fears, which is fine. Underline two key components: you have to stay in until you are used to it (at whatever step you are on), and it helps to make it fun. Figuring out the steps is often referred to as creating a fear ladder or hierarchy. Afraid of dogs? Begin by looking at pictures of them in books. Watch movies and YouTube videos. Move to looking at real dogs from afar, then dogs that are caged or otherwise contained close-up. 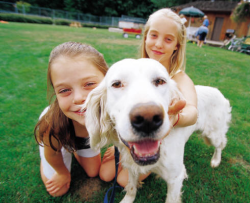 With this step-by-step approach, dog-phobic kids can eventually approach a familiar, calm dog, a less familiar calm dog, a familiar jumpy dog, a less familiar dog, etc. Small steps, repeated again and again until they can be accomplished with little to no fear, will help even the most severely affected child master just about any challenge. Afraid of the dark? Play in-the-dark games with your child. Send him on brief dashes upstairs at dusk (run upstairs, touch every bed and run back down by the time I count to 30 – go!). Scared of a Disney character? 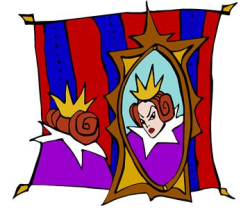 Find pictures online and reproduce them to decorate (the evil queen is much less scary when you put her in a tutu and silly hat). Freeze a frame showing the scary character and toss foam balls at it, or make up a back story (what she ate for lunch that day, what kind of pet she had as a child). Watch the movie a segment at a time, perhaps with earplugs at first, or while talking back to the scary character. When you expose (in small ways) again and again and again, two important things happen. Your child discovers that while she might feel nervous, nothing bad actually happens (remind her that we call this a false alarm). And she gets used to whatever was causing such distress; it no longer has the power to scare her. Desensitization is empowering, teaching a set of skills your child can use far into the future, leaving her less vulnerable to those things that seem like tigers but are actually no more harmful than hares.